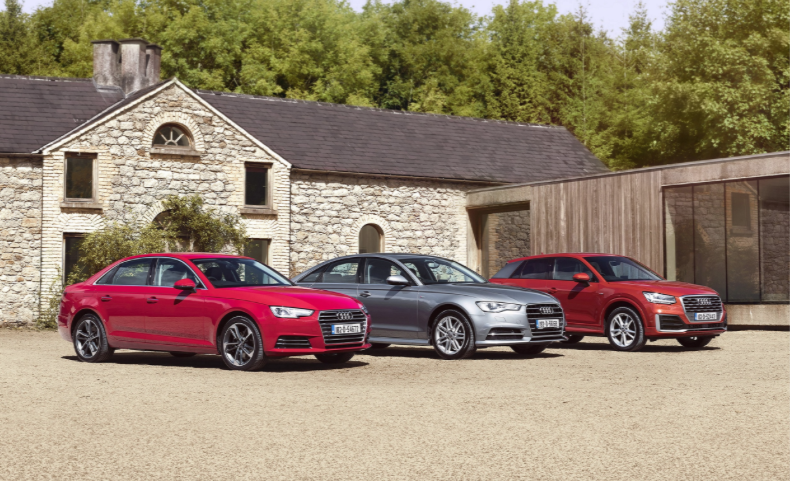 Audi Ireland has announced details of the Audi Inspiration 182 sales event with truly exceptional 1.9% APR offers across all Audi A3, A4 and A6 models. These exclusive offers also include special edition upgrade packages making it more affordable than ever to drive an Audi. The Audi Inspiration 182 sales event takes place across 11 authorised Audi dealerships nationwide from now until 31st of July while stocks last. The Audi A3 is available from an incredible €249 per month PCP. With its innovative design and sophisticated technology, the Audi A3 is the perfect example of Vorsprung durch Technik. The Audi A3 models, which include the A3 Sportback and A3 Saloon demonstrate the models versatility, combining innovation of design and technology, making it a versatile choice for all sorts of lifestyles. 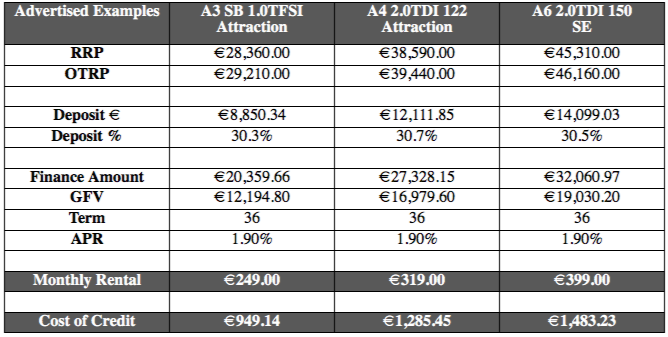 As part of the Inspiration 182 sales event, the Audi A4 is available from an exceptional €319 per month PCP. The striking Audi A4 model boasts a range of upgrade packs. The sporty yet sophisticated A4 SE Edition 50 upgrade package includes a metallic paint finish, 18” alloy wheels ambient lighting pack, front parking sensors, comfort armrest and heated front sports seats. The Audi A6 is available from €399 per month PCP, representing outstanding value. The iconic Audi A6 comes with a number of exceptional upgrades, such as the Audi A6 SE Comfort Pack, which includes 18” alloy wheels, MMI Navigation Plus with touch pad, smartphone interface, electric seats, reversing camera, LED interior lighting package and electric mirrors. Furthermore, the striking Audi A6 S Line model is available with a similar Comfort upgrade package as above with additional features such as 19” alloy wheels, flat-bottomed steering wheel and Valcona leather finishing. Alongside the Inspiration offers, Audi’s premium range also includes the all new Audi A8, the premium car-maker’s flagship model, which sets a new standard in luxury driving. The new Audi A7, a sporty yet sophisticated four-door Coupé, embodies the essence of Gran Turismo, with dynamic lines, systematic digitalisation and a sporty driving experience and striking interior design. While the stylish Audi Sport range includes the new Audi RS 4 Avant, and combines breath-taking driving performance with accessibility for everyday use. For high performance, the Audi RS5 Coupe boasts a 2.9 TFSI V6 bi-turbo engine, which has been engineered to provide superior performance and higher efficiency. For further information on the entire Audi range visit www.audi.ie or contact your local authorised Audi dealer. Audi Inspiration runs the 31st July, while stocks last. Terms and conditions apply.